Available from Steam as a free download. The High-Resolution Texture Pack is an official add-on for Skyrim that replaces many textures throughout the game with versions of a higher resolution. It was made available on February 7, 2012 alongside the Creation Kit and Fall of the Space Core, Vol 1 and is the first downloadable content for the game. The latest update of this pack not only adds support for the latest add-on Dragonborn but also enhances support for two already existing add-ons, Dawnguard and Hearthfire. The texture pack has not officially been made available for the Special Edition as it is obsolete. Once you've added the add-on to your Steam account, the 4 GB worth of files can be uninstalled by going to Skyrim's page in your Steam library and unchecking its entry in the DLC section. You may still need to delete them manually after perfoming these actions. After doing this, the files will no longer re-download themselves automatically when starting Skyrim. It can also be temporarily disabled by opening the Data Files menu from the launcher and unchecking the boxes next to the related files. The texture pack can cause several graphical glitches, such as clipping issues and missing textures which are displayed in magenta or black. 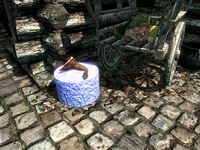 The three most notable textures affected by this issue are the chopping block, fireplace wood, and Paarthurnax's chin tusk. An update to the DLC in February 2013 fixed these issues. This page was last modified on 2 January 2019, at 18:37.